New Digitally Remastered Version Of The Beatles' 'Yellow Submarine' To Hit UK Cinemas . Beatles Radio: The Beatles, Solos, Covers, Birthdays, News The Fab 4 and More! A new, digitally-remastered version of The Beatles’ classic animated movie Yellow Submarine is returning to cinemas for the first time since 1999. The new film is set to play in UK and Ireland cinemas via an event-style release on 8 July, 2018 to coincide with the 50th anniversary of its original release. Tickets are due to go on sale on Tuesday, 17 April. 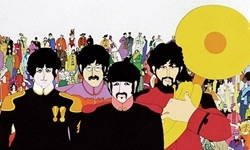 Yellow Submarine, based upon a song by John Lennon and Paul McCartney, is a fantastic tale brimming with peace, love, and hope, propelled by Beatles songs, including "Eleanor Rigby," "When I’m Sixty-Four," "Lucy in the Sky With Diamonds," "All You Need Is Love," and "It’s All Too Much." When the film debuted in 1968, it was instantly recognised as a landmark achievement, revolutionising a genre by integrating the freestyle approach of the era with innovative animation techniques.